Namassssskar, main hoon Aaaaashutosh”. This familiar refrain, first heard on Aaj Tak and now echoing at the IBN 7, is the signature tune of the man who is now at the helm of affairs at one of the biggest channels in India. The name itself is an introduction for Ashutosh, the Managing Editor of IBN 7. A small town boy born to an Income Tax Official, Ashutosh says he never dreamt of being a journalist. “The first time I ever contemplated penning my thoughts was in 1989 when in China, Tiananmen Square was making news and in India, the Ayodhya issue was on the boil. I wanted to write and got an opportunity at Saptahik Hindustan to write occasional columns.” And this small step of giving words to ideas on paper led him to the towering heights. Ashu’ to his friends and colleagues, he says he did have a wish to be able to make a positive intervention in society, to be able to say what he felt at the top of his voice and from the bottom of his heart. The man who never hesitates to call a spade a spade on TV, says the more he got attached to the medium, the better was his career progression, blossoming day by day. Did he ever think he would be the Editor of a leading media organisation? The answer is a resounding ‘No’. Ask him about his ambitions and he tells you that all he ever wanted was to be able to earn Rs 10,000 a month, own a Maruti and a two-bedroom flat that he could call his own. Delhi gave him that and much more. But the capital itself happened to Ashutosh by chance. His father wanted him to be a doctor. He even appeared for the CPMT but failed. And that helped shape the scheme of things to come. A science graduate from Allahabad University, Ashutosh applied for Masters in Philosophy from the same varsity. At this point someone suggested UPSC as a brilliant career option and his father became excited at the prospect. Ashutosh was told that Delhi is the place to prepare and arriving in the national capital he chanced upon a JNU advertisement offering admissions in various courses. Confesses Ashu, “I had not heard about JNU till my graduation. And here was a marvellous place in the heart of Delhi which offered hostel facilities as well. What more could I have asked for? I applied for MA in International Relations as well as in Political Science and got through both.” Ashutosh took up International Relations as it was the only place in India where International Politics is taught as a subject. Since the session in Allahabad was running two years late, Ashutosh could afford to obtain a double MA degree – Philosophy and International Relations. Meanwhile, he tried for the UPSC exams but could not go beyond the prelims in his first attempt. In his second attempt, he cleared the prelims but did not sit for the main examination. Probably destiny had chalked out a different path for Ashutosh. He got an opportunity to write for Saptahik Hindustan, thanks to a reference from his JNU teacher Pushpesh Pant to Editor Mrinal Pande and UPSC soon became a thing of the past. Ashutosh vividly remembers the headline of his first article that came out in 1990 as a cover story and fetched him a handsome sum of Rs 300 – Aatankvad: kab kyun aur kaise. Soon he was offered a position with the magazine and his first article was on Nelson Mandela. If there is one person he shall always remain indebted to, it is Pushpesh Pant, who took him under his wings during his early days in Delhi; later the role of mentor was taken up by his Editor Mrinal Pande. After spending around three-and-a-half years with Saptahik Hindustan, Ashutosh got the urge to move on. Mrinal Pande suggested him to try his luck at BiTV. And TV happened to Ashutosh by compulsion. Ashutosh did not stay at BiTV for very long and senior journalist Shailesh told him that celebrated late anchor SP Singh, the man at Aaj Tak, was looking for him. A year before that S P Singh had rejected Ashutosh’s request for a job, and here he was seeking to meet him! Ashutosh went to see the man whose ‘Eklavya’ he calls himself; and Aaj Tak opened its door to him. “At Aaj Tak, I was never SP’s Pandava. It was me who took him as a guru. From him I learnt how excited you should get with news. 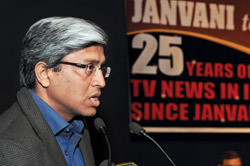 I learnt how news should be covered, and spread,” says Ashutosh. As Managing Editor, his routine is gruelling but disciplined. He gets up at 6.15 am, goes for a 45-minute walk, comes back to read 10 to 12 newspapers and leaves for office by 9.10 am. At office by 9.30, he begins his hour-long edit meet at 10.00 am sharp. After that, he “flows with the flow of news where the agenda is-news, news and news”. In between he finds time to read and be with his friends, where during gatherings, fish fry is his favourite and green chillies a must. The boy from Mirzapur, who made it big in Delhi was born in Benaras. He had not seen electricity till he was in class four, lived in Lucknow in a one-room accommodation with a family of six, used a public toilet as a child, the verandah in his house served as a kitchen and he studied under the lantern. Quite overwhelming actually.